How Party Crowd Rewards work! Share with friends and earn party rewards ALL THE TIME! It's that simple! Learn how Party Crowd Rewards works. It's easy. Earn party bucks EVERY TIME you share. 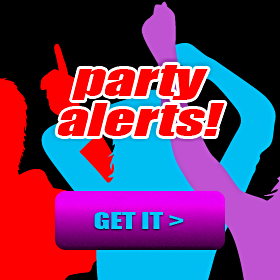 Use your party bucks for anything you want, including Crowd Party Tickets, and apparels! It's a beautiful thing, the more you share, the more you earn! So how do you go from sharing to earning rewards? Join the Crowd, and get your Party Crowd Link. You earn Party Bucks when certain actions occur! You use your Party Bucks to get FREE rewards! What is a Crowd Link? Your Crowd Link is a unique address that you can share with friends everywhere. We use it to track and credit you for actions that happen on our website because of your sharing. How do I get my Crowd Link? Just join the Crowd. It's free and takes just a second. Party Bucks is our very own virtual currency. On our website, you can use Party Bucks to pay for anything. How do I get Party Bucks? You earn Party Bucks by sharing with friends, and causing certain actions to occur because of your sharing. What actions do I get paid for? Here is our complete Party Bucks actions and rewards. How do I know I earned some Party Bucks? Very simple. You get an email alert every time you earn! How do I keep track of my Party Bucks balance? Very easy, just login and visit My Party Bucks anytime. What is the maximum Party Bucks I can earn? There is absolutely no limit to the amount of Party Bucks you can earn! No, Party Bucks that you earn never expire. How do I convert my Party Bucks into FREE Rewards? Everything we have can be your FREE reward! From Tickets to Crowd Parties, to Crowd Apparel ( t-shirts, hoodies, etc..) from our store, anything you want is yours for FREE! When you get to the payment page, choose to pay with your Party Bucks! I want to share pictures, do you have web banners? Yes, we do. You can download web banners right here! 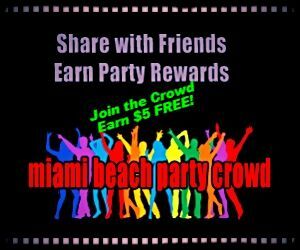 Join the Crowd & earn $ 5 Party Bucks right away! Share with friends, earn party rewards!